This is a corrected version of the story originally posted July 28. Due to inaccurate information provided to The Catholic Review, the religious order that staffed St. William of York School was reported incorrectly. The Sisters of the Holy Union of the Sacred Hearts taught at the school. William J. McCarthy Jr. is just getting started Aug. 1 as executive director of Catholic Charities, but his roots in the outreach organization stretch back to high school. Back in the late 1970s, while attending Loyola Blakefield in Towson, McCarthy served meals at a Catholic Charities-run soup kitchen in Baltimore. He also volunteered as a math tutor for inner-city children at a weekly after-school program. Days before the 48-year-old parishioner of the Church of the Nativity in Timonium prepared to take over an agency that annually helps about 200,000 people in 80 programs, McCarthy reflected on how his Catholic faith shaped him. 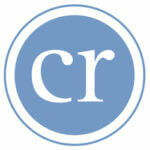 It’s a world view that will continue to guide him as Catholic Charities is challenged with unprecedented demands. St. William of York in Baltimore was McCarthy’s center of the world as a child. He attended school there, served as an altar boy, played sports and won a stint as student council vice president. The booming school had so many students that classes were held in the basement of the convent and the balcony of the auditorium. McCarthy has fond memories of the the Sisters of the Holy Union of the Sacred Hearts who staffed the school and shaped his early views of social justice. They emphasized the importance of understanding, tolerance and fairness in the wake of Sen. Robert Kennedy’s assassination and the riots that followed. Catholic culture permeated McCarthy’s family life as well. His father was a lay corporator of the parish. Two of his aunts were Dominican nuns and his cousin was Father Flavian Burns, a well-known Trappist monk who ministered at Thomas Merton’s famous Abbey of Our Lady of Gethsemane in Kentucky. Father Flavian sometimes celebrated Mass in McCarthy’s home. “I remember that we celebrated the sacraments in a way that showed how important and exciting they were,” McCarthy said. That strong faith would provide a support that sustained McCarthy during one of the most difficult times of his life. Erinn, his daughter, died of bone cancer following a three-year struggle that began at age 11. McCarthy wears a small crucifix that was blessed by Pope John Paul II and given to Erinn by former Baltimore Auxiliary Bishop W. Francis Malooly. McCarthy said he was inspired by the way his wife, Maria, cared for their daughter throughout her illness. Erinn faced cancer with courage, he said. McCarthy’s daughter would be “extremely proud and pleased” to know that her father is working for Catholic Charities, he said. “We had conversations about social justice,” said McCarthy, whose family is active in a capital campaign benefitting Maryvale Preparatory School in Brooklandville – the school Erinn attended. 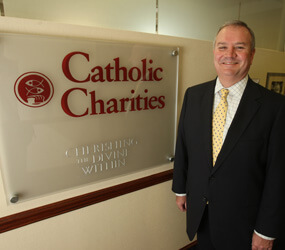 McCarthy, former president of SunTrust Bank-Greater Baltimore and executive vice president for wealth and investment management of SunTrust Bank Mid-Atlantic, takes over Catholic Charities at a time when funding is limited as a result of the nation’s economic challenges. He plans on spending his first six months visiting Catholic Charities’ many programs. “It’s at times like these that the demands on the programs are great – and probably have never been greater,” he said. McCarthy said he has confidence in the mission and people behind the agency. He credited Hal Smith, his predecessor, for growing the organization and leaving the charity in a strong position. McCarthy is delighted that some of the same religious sisters who taught him at St. William now work for Catholic Charities. “Sometimes they out me for my behavior problems in the third grade,” he said with a laugh. Ten thousand volunteers and 20,000 donors support Catholic Charities’ programs, he said. Our Daily Bread Employment Center alone serves more than 250,000 meals a year and Catholic Charities has an annual budget of $125 million. McCarthy believes his Catholic faith, his commitment to the Baltimore region and his many years in the business world are assets in his new role.